Getting the right balance between looking professional and promoting your Christmas offering can often be difficult, but there’s no reason you can’t keep your team looking stylish over the festive period! Although red is seen as a bold colour, it can lend well to your current uniform if added as subtle accents with accessories. Today at Simon Jersey we’re going to be providing some tips to ensure your staff can make the most of their Christmas hospitality uniform, which will give you a better chance of retaining some of those first-time customers who are dining with friends and family this festive season. As your first point of call for all your customers, the front of house team’s uniform is arguably the most important to create the right impression. Your brand aesthetic should be easily recognisable at the door to set the tone for the establishment, so for example, if you manage a five-star restaurant you will want diners to experience the luxury service before they even sit down to dine. For this type of restaurant, you would be looking for a more traditional style for your Christmas hospitality uniform; a crisp white shirt, formal trousers, suit jacket and a dark red tie to finish would be perfect way to show your customers you’re subtly joining in the festivities, whilst retaining a sense of sophistication. A more casual dining restaurant can opt for a relaxed uniform for front of house staff. We’d say to still keep it fairly smart with work shirt and trousers, but maybe add a tweed waistcoat to add a trendy twist. 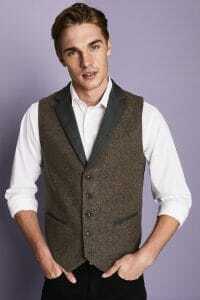 Tweed is very on trend this winter as it gives a cosy, warm vibe that will be felt by your customers. It’s an understated way to add depth to an outfit without being too bold, and fits with businesses that have a fashionable, millennial clientele who would appreciate the slight nod to a Christmas theme. As with any time of the business year, there should ideally be a clear distinction between your front of house team and your waiting team. Their roles are often very different, and you don’t want to confuse diners, especially if they have never visited before. A great way to bring a touch of Christmas spirit into your bar or restaurant and create a unique look is by simply adding a red or green apron. 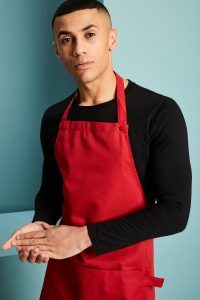 If you want the Christmas work apron to really stand out, we suggest pairing it with a black work shirt and trousers, as this way the bold colours will really pop. For a subtle Christmas hospitality work uniform, try working with neutral tones, such as browns, khaki and beige. These all look great with denim shirts or jeans, and because they are warm colours that you can keep your uniform in line with the seasonal aesthetic. Our canvas aprons would fit really well if this is the type of look you wanted to go for, the material and design of the aprons gives them a rustic appearance that suits the time of year. Just because it’s Christmas doesn’t mean you have to completely change your colour scheme, find colours that work with your current style and just give them a small twist! Bar staff uniform is where you can have more freedom with your Christmas hospitality uniform ideas. There’s often lots of drinking over the festive period which means merry customers who are looking to get into the Christmas spirit and have a good time, and your bar staff uniform should reflect the atmosphere! Giving them a bright coloured work apron and some Christmas props will create a joyful environment and get people in the mood to spend more money with you. 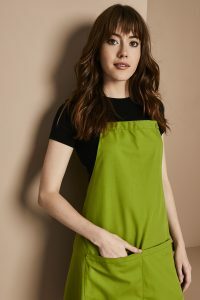 We have a wide range of aprons to choose from depending on what style you need, and we’d recommend a bib design for bar staff uniform as it will be more visible. If you’re thinking about getting logo embroidery using our Simon Jersey uniform personalisation service, it will be noticed by more customers if it’s at eye level. This is a good way to get your business to stick in a customer’s memory, a logo is more distinctive than just a name and will get people to associate the fun time they had at Christmas with you, creating positive repeat custom. You can find everything you need to create the perfect Christmas hospitality uniform on our website, from bar staff aprons and waistcoats to workwear accessories. If you need extra help in deciding on your work uniform requirements, please do not hesitate to contact our Simon Jersey customer services elves on 03444 994414 for further guidance.